Amazing pink and cream variegated foliage all year round. Experience Nandina - a bright flash of dazzling colour for your borders or patio pots. Evergreen and invaluable in winter when there's little colour around, this amazing variegated variety has a sultry pink glow to its amazing foliage. 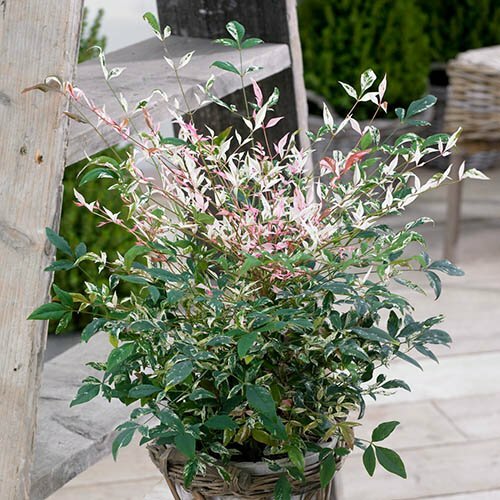 A true multi-season feature plant, the variegated leaves and small creamy-white flowers are followed by green berries which turn sealing-wax red - just superb! Supplied as and established plant in a 2L pot. As it's evergreen, Nandina retains its foliage throughout the year and the colours change as temperatures dip, taking on deeper and more saturated hues. A true multi-season feature plant, in spring new leaves emerge flushed pink, green and cream, then in summer, small creamy-white flowers are followed by green berries, before the leaves develop more colour and the berries turn sealing-wax red - just superb! Plant Nandina in a sunny spot or in light shade – its colours will become more intense if it is grown in full sun in a sheltered spot out of the wind. Plant your Nandina in well-drained, rich soil. Keep well- watered, the soil should be moist but not saturated. Pruning is simple - just take out any dead stems You can remove up to one-third of the Nandina's canes at a time to encourage more growth. Apply a general-purpose feed in late February or early June.